MMidem, an international event for the music business, has announced the 10 finalists in the 4th edition of the Midem Marketing Competition, and Dotted Music is one of them! 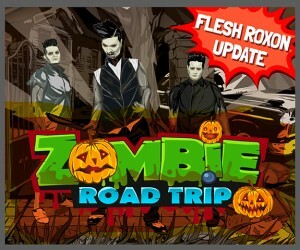 The Midem Marketing Competition is a contest that celebrates the best of creativity in music marketing and advertising, and Dotted Music has been chosen for the Flesh Roxon on a Zombie Road Trip campaign. The marketing magazine Marketing Week chose the 10 finalists from more than 100 submissions. The finalists comes the far reaches of the world: Hong-Kong, the Netherlands, Denmark and the USA, to name a few. The finalists will be invited to Midem 2015 to present their work before the jury, consisting of experts from the music industry. The jury will evaluate each campaign and select the three winners – Gold, Silver and Bronze – who will be announced on 7 June at the event. Midem 2015 will be held from 5-8 June at Palais des Festivals in Cannes, France. For more information about the competition and the finalists, click here.